Europe's leading players are at risk of being racially abused at this summer's European Championship, the head of the worldwide union for footballers says. Theo van Seggelen, secretary-general of FIFPro, also fears visiting fans will face problems with Polish and Ukrainian supporters away from stadiums. He said some fixtures will be played "in the middle of nowhere" and that Ukraine was not a suitable host nation. "Ukraine will be very difficult for fans," Van Seggelen told BBC Sport. "I think that this tournament will not be remembered for the atmosphere - that for me is 100% sure. Ukraine is not the ideal place to play this kind of event." FIFPro's own research into racism, violence and match-fixing in eastern Europe, published in February this year, revealed that just over 10% of professional players surveyed had been victims of violence, with over half of all those incidents blamed on supporters. And, with 9.6% of players in the region claiming in the report they have been racially abused, Van Seggelen fears that teams playing at Euro 2012 may be subjected to similar abuse from Ukrainian and Polish supporters. "We have to hope [the eastern European fans responsible for racism and violence] are not the same people who are watching the games in Poland and Ukraine [at Euro 2012] because then we have a real problem. "I'm sure that the fans from the European countries who have qualified... will not be any problem. Four years ago in Switzerland and Austria it was fantastic. "If the majority of fans are coming from these two countries [Poland and Ukraine], then I'm not 100% convinced that we will not have accidents, even in the stadiums." "I think that Uefa is capable, with the support of the government, of preventing these kind of events. But I have more fear for what happens outside the stadium, especially for the fans, especially in Ukraine." Both countries have invested heavily in infrastructure projects and new stadiums - Poland alone is understood to have spent around 20bn euros (around £18bn). But criticism over preparations for the tournament still remain. Last week Uefa president Michel Platini hit out at hoteliers in Ukraine, describing many of them as "bandits and crooks" for setting exorbitant prices for accommodation. The Ukrainian government has promised to address the issue within 30 days as it makes final preparations for the biggest sporting event to be held in the country since it gained independence following the fall of the Soviet Union in 1991. But for Van Seggelen other issues persist. "There are some problems, especially in Ukraine, with the transportation," he said. "There are also problems with the language. These people do not speak other languages." The draw for the tournament has also ensured that some of the giants of European football will meet during the group stage of the tournament. But Van Seggelen is dismayed at some of the locations for the eight host cities - including the choice of Ukraine's second largest city, Kharkiv, for the Group B match between Netherlands and Germany. 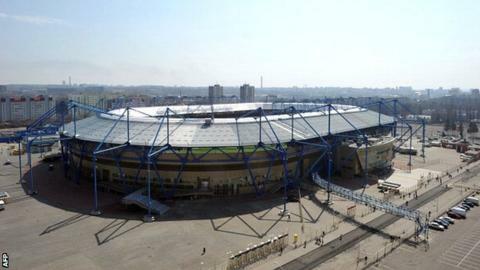 The old rivals are due to meet at the 38,500-capacity Metalist stadium on 13 June. "At FIFPro we have some doubts about the choices of the locations in Poland and Ukraine," he added. "Holland against Germany is played in the smallest stadium in Ukraine, somewhere in the middle of nowhere. "Football is about fans, and I don't want to be too critical, but how is it possible that these kinds of games, which are highlights of the tournament, are played in these stadiums in the middle of nowhere?"